The reports we are reading from the Texas District of church and members' property damage are sobering and widespread. As with our response to the flooding in our area last summer, we have decided that our response should be focused and have a personal connection. Peace Officer Ministries deployment. We are currently assessing needs, but I may deploy to the area. We will need help covering the associated expenses. In the past, I have helped conduct critical incident debriefs, ministered to officers and their families, and even assisted officers in wellness checks and calls for service. Your generosity and flexibility allows me to serve in a very unique way. The toll of critical incidents on our first responders is sometimes overlooked by more traditional relief organizations. Connected Congregations. 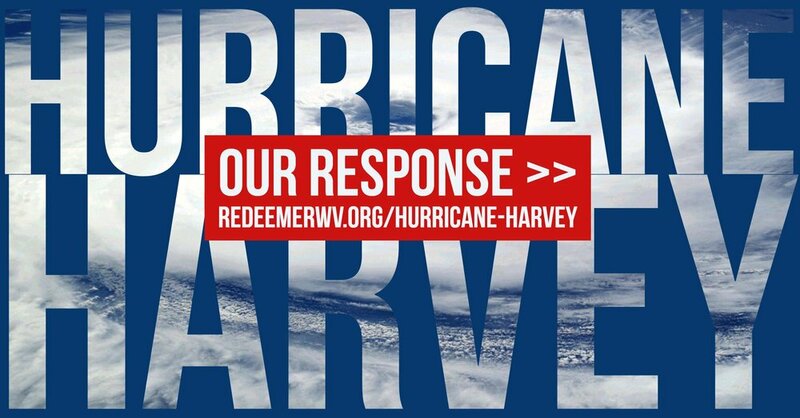 Monday morning, I was contacted by Liz Giertz about how Redeemer is mobilizing to help hurricane victims. Matt and Liz recently moved here from Texas with their two sons. Liz has volunteered to spearhead our response in Texas! She is in contact with their previous pastor and will be letting us know how we might be of best financial support. Look for updates as the needs are defined, and introduce yourself to the Giertz family! Connected Families such as previous Redeemer members Jonathan and Kim Raess and Gail Bostic (sister of Greg Bradford). They will be helping me identify how we might be of best direct financial help in the area. Again, more details will be forthcoming. Finally, and this is of great importance to our mission and ministry, Volunteering. Volunteer this Friday for Live on the Levee as an immediate way you can help.We will be collecting financial donations from the community to support the hurricane relief. Because I am unable to attend Live on the Levee this Friday, we could use a few more hands to be present at our booth to make a strong showing in support of the victims in East Texas. All you need do is help set up, help pack up after the event, and hang around the tent during the event to be friendly to people and answer questions they may have about donations and Redeemer.